Confronted with an urge for a s’more, a second urge for creamy peanut butter and no urge to go outside in the rain… a cupboard search began. In the baked goods box was a half bag of tiny marshmallows left over from the Thanksgiving sweet potato casserole and a bag of red and green wrapped peanut butter cups from the after Christmas sale. A quick check of the cracker supply and it was a go. 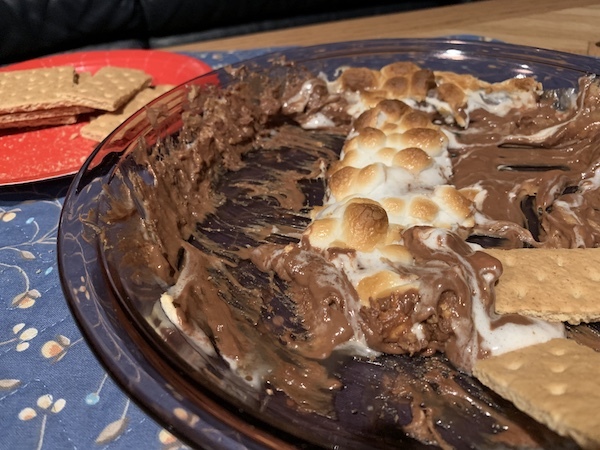 Peanut butter s’mores, but made fast and easy and totally transportable to the couch (without messy marshmallow running out from every bite) for some rainy evening movie entertainment. This super simple, super fast recipe will provide slow motion goodness that is the ultimate in comfort foods. 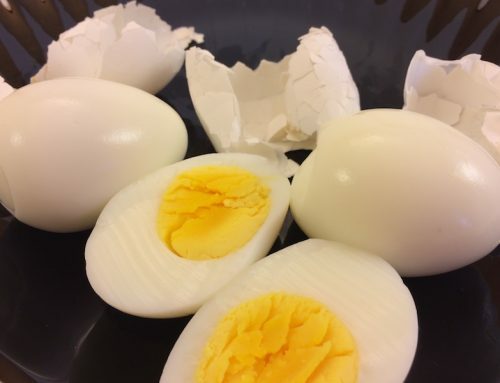 This simple recipe requires three easy ingredients in any amount available. There’s no need for any appliances, measuring cups or even spatulas. It is one of the easiest, quickest and tastiest warm desserts that anyone could possibly make. Trust us. As promised, there is no measuring, no mixing and no utensils involved. 1) Just pre-heat the oven or, better yet, toaster oven if available to 400°F. 2) Unwrap the peanut butter cups and place them into ramekins or any other oven safe dish with fairly low sides. A pie plate works great too, depending on how many hands will be dipping into the pan – because we can pretty much guarantee that there will be a lot of hands is why we suggest using ramekins and making one per person. 3) Sprinkle the marshmallows on top. 4) Bake for 2 to 5 minutes depending on the size of the pans being used – ramekins for about 2 minutes and pie plates for about 4 minutes. 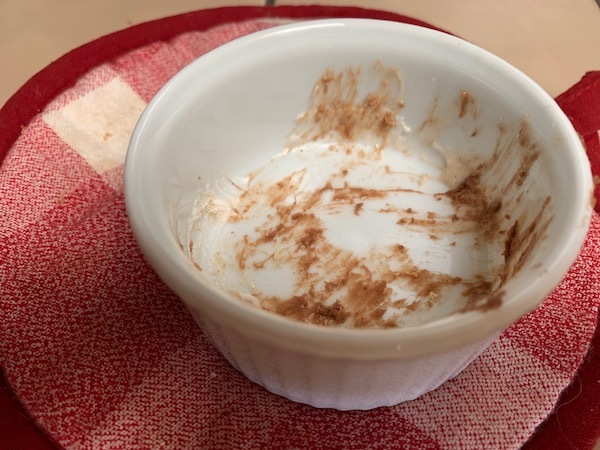 Do not overcook, the chocolate will burn quickly and become inedible. 5) Turn the oven on low broil and leave it for another minute or two..
Again, it will quickly burn so don’t over broil either. 6) Dip in the graham crackers and enjoy! Be careful tho, it will be hot. Make it quickly just for yourself, as shown above, or just as quickly for the enjoyment of a whole table full of friends. With the graham crackers broken into quarters, there is no need for double dipping. Although, we did notice a few people turning the graham cracker pieces sideways before dipping to maximize the dipping surface – smart! It’s easy cleanup on this one too, just throw the pan in the dishwasher. Although, it will be scraped pretty clean with graham crackers prior to that! 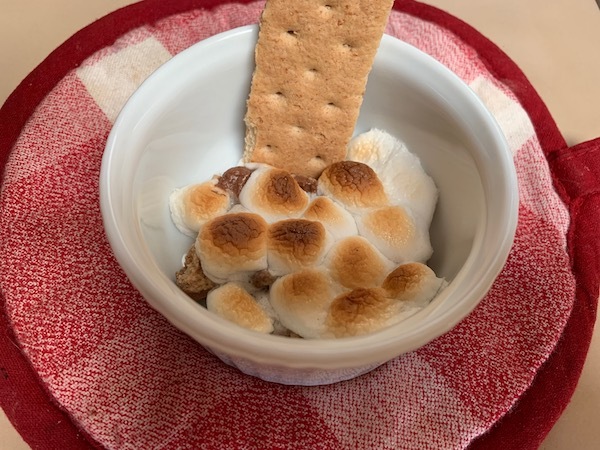 For s’more s’more ideas, see our s’more bites post. For a half cookie half s’more dessert idea, see our s’mookie recipe. To find out how long marshmallows last, see our marshmallow page.